When Casey York asked if I would participate in her Modern Applique Illusions blog tour, of course I said Yes! as I have admired her work for years now. I first ran into Casey at the MQG Meet-Up in Kansas City back in the Spring of 2012. We chatted about the St. Louis MQG, as she was looking to join our guild, and I being the guild's President was more then eager to talk about all of the wonderful things that our members bring to the table, and how much fun we have at our meetings. Soon enough at our Show & Tells, I saw that Casey's work stood apart, as she had such a masterful way of creating quilts by way of applique, something that many modern quilters had not yet explored. She went onto win one of the top prizes for the MQG Michael Miller Challenge with her quilt ONWARDS; which is one of the many patterns you can purchase directly from her shop, and is one of the quilts that inspired her to write this book. In Casey's newest adventure, Modern Applique Illusions, she takes you on a journey where you can explore different methods of creating depth and perspective through applique and simple quilting designs. I have had the pleasure of seeing several of the quilts from her book up close and in person at a recent Book Signing. Let me tell you...this is one quilter you definitely need to keep your eye on, no matter if you already love applique, or are looking to dip your toes in the water. Casey has created such captivating scenes in her quilts, and she joyfully guides you through the steps needed to replicate them, adding your own personal touches along the way. While I adore many of the quilts from her book, one of my favorites is TUNNEL VISION; which ironically involves the least amount of applique (go figure). Yet, for someone like me who is quite timid about applique, it makes me happy to see that she has taken the time to include information and projects for several skill-levels. 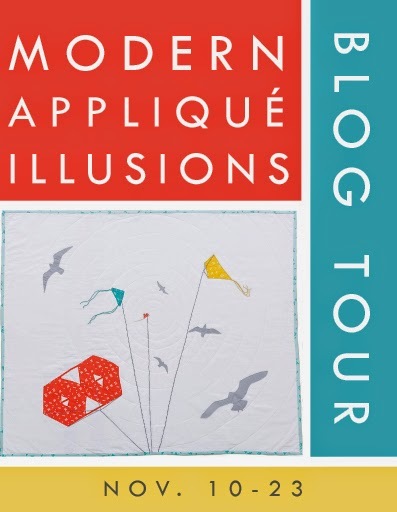 I encourage you to check out the whole Blog Tour to see what treasures the other "tour-guides" have made inspired by Modern Quilt Illusions. Also, don't forget to check in with Casey's blog each day as she is chatting about the quilts from the book and offering up some giveaways too. And if you want to pick up a signed copy of her book, head over to her shop. 11/18: Krista Robbins / SewWhat'sCooking? Now, I am delighted to tell you that Casey and C&T Publishing have offered a copy of her book to one of my lucky readers; whom will be chosen randomly through Random Generator. To enter, just leave me a comment below telling me what scene, object, person, etc. you would like to bring to life through an applique quilt. If you are based internationally, you will receive an electronic copy of the book. If you are based in the US, you will receive a hard-copy. Please be sure that I can reach you by email. Comment moderation is ON simply to weed out spam...so your comments will post throughout the day. My mother made an applique pillow as an ode to a mysterious sepia tone photo she found in an attic of a house she moved to in the '60s; She called the stern looking lady "Mother." I would love not only to make my own version of Mother, but also of my own mother! I think a river would be kinda cool. I just created a quilt from the movie Tangled using applique, and I'd love to do Frozen next. Or the NYC skyline. Thanks for the chance! I love the looks of the bare trees in the winter so I would love to make a quilt like that. Love the trees and their shadows. I'd like to try that. I would love to make a silhouette of geese flying against a sunset wall hanging. Thanks! I want to make an appliqué quilt of my husband's plane. Thanks for the review and giveaway. I would really love to do a stylized picture of my kids standing on a cliff with the Malibu beach in the background. I know... sounds crazy but I think Casey's perspective advice might make it possible. Something Holiday-ish... Maybe Santa and reindeer or elves! I would like to make an appliqué of penguins walking on the ice. A beach scene would be pretty. I would love to do a tree in the fall, with the leaves falling and piling on the ground. Thanks for the great write up on Casey's book! HI,maybe something for Christmas! Thanks for sharing! I fell in love with the Chicken Scratch and would to try that. The scales of justice! I've been trying to find the right technique to bring to life the "quilt in my head" and think this might be it. There is a massive oak tree that I passed everyday on my way to work for 13 years. I always loved looking at it during the winter when the branches were barren and hope to one day make a wall hanging of it. Something Disney would be fun. I'd like to do an appliqué of my cat fishing in our small pond! I'd like to do a river as I live on the bank of the River Severn in the UK!! I want to make an under the sea baby quilt with an appliqued octopus for my cousin's new baby but I've never done an ambitious applique project like that. I'm nervous! I have some photos of the ocean from Del Mar Califonia that would be a great source for this type of quilt. I love the tree quilt!